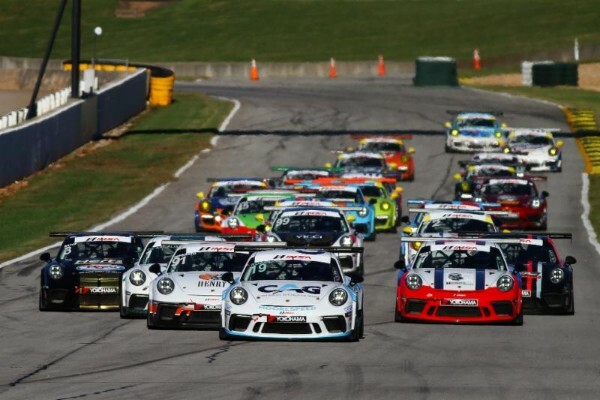 Zacharie Robichon won his seventh Porsche GT3 Cup Challenge USA by Yokohama battle on Friday morning at Road Atlanta while Trenton Estep won the season-long war in the 2018 season finale. Driving the No. 19 Moorespeed Porsche GT3 Cup machine, Robichon started the race from the pole position and led every lap en route to victory in the 45-minute race. It was the Canadian driver’s seventh win in eight tries this season and came in addition to another 11 wins out of 12 races en route to the 2018 Ultra 94 Porsche GT3 Cup Challenge Canada by Yokohama title. “It was a great race,” said Robichon, who also participated in the IMSA Prototype Challenge Presented by Mazda race immediately before the GT3 Cup Challenge USA round Friday morning. “I knew coming out of the P3 car that I had to change my mindset as quick as possible. Right from the beginning, I was like, the best way to do it is just full attack and I was able to get a good gap and then just keep pushing the whole way. Robichon beat fellow Canadian Roman De Angelis to the stripe by 9.654 seconds to get win. It was De Angelis’ 10th podium result in 16 races this season aboard the No. 1 Kelly-Moss Road and Race Porsche. Estep, meanwhile, finished third for his 14th podium result of the season in the No. 3 JDX Racing Porsche which buoyed him to the 2018 Platinum Cup championship for Porsche 911 GT3 Cup cars built in 2017 or 2018. In the Platinum Masters class for drivers over the age of 45, Alan Metni peaked at the right time with victories in three of the final four races of the season, including both races at Road Atlanta in the No. 99 AM Motorsports/Kelly-Moss Porsche. His win Thursday evening moved him into the Platinum Masters points lead, and his victory Friday morning cliched him the title. “This is a progression series, a training series, and we’ve been learning all along the way, getting faster and faster,” Metni said. “We knew if we just kept focused on our own job and did our jobs, we’d eventually catch up. Michael Levitas finished second in Platinum Masters in the No. 36 TPC Racing Porsche, while Charlie Luck closed out the season on the podium with a third-place run in the No. 45 Wright Motorsports machine. Luck finished second in the championship. In the Gold Cup class for Porsche 911 GT3 Cup cars built between 2014 and 2016, Jonathon Ziegelman won his second race in as many days aboard the No. 72 JZ Motorsports Porsche. The pair of Road America rounds were Ziegelman’s only races in the series this season. Victor Gomez IV, who clinched the Gold Cup title Thursday evening, finished out his season with a second-place run in the No. 25 NGT Motorsport Porsche. His season stats were impressive, 11 wins and a total of 14 podiums in 16 tries this season. Rob Ferriol wrapped up his first season in Gold Cup with a third-place run in the No. 5 TPC Racing Porsche. It was his 11th podium result of the year. Bill Smith took home the Yokohama Hard Charger Award from Race 2 as the Gold Cup driver who improved the most positions from start to finish in the race. Smith finished 17th in the overall running order in the No. 42 Topp Racing Porsche after starting 25th. Teams and drivers will celebrate the 2018 season on Friday evening with an awards ceremony at Porsche hospitality at Road Atlanta.